This time 4 years ago, I was living in a little apartment in the beautiful city of Barcelona. I say ‘living’ but it was really only a 6 week holiday. These days when I travel I like to rent an apartment rather than stay in hotels. I try and adopt the everyday life of the locals as much as possible. For me travel is about exploring what it like to live, shop, cook and eat out in a different place. Much more fun than visiting churches and museums. One of my favourite indulgent tapas discoveries was a dish called ‘patatas bravas’. It’s basically fried potatoes with a hot tomato based sauce that’s sometimes also served with a garlicky mayo. Soo good. So when I spied the recipe for potato with ‘brava’ sauce in the latest Movida book I had to try it. Fergal’s cousin Dan (aka ‘Dan the man’) and his parents were over for a BBQ. The plan was to have BBQ chicken with some salad and the potato with the sauce on the side. But as so often happens, things evolved at the table. Everyone kept going back for more of the ‘brava’ sauce to have with the chicken. Definitely a winner! Inspired by Frank Cammorra’s latest book, Movida. I’ve used swordfish here but most fish will be lovely. If fish isn’t your thing see below for other ideas. 1. Heat a frying pan on a medium high heat. Rub fish with a little oil and sprinkle with sea salt. 2. Cook fish for 3-4 minutes on each side or until you’re happy. 3. While the fish is cooking stir together the mayo, ketchup & Tabasco. Taste and add more Tabasco if needed. Or if too hot add more mayo. 4. 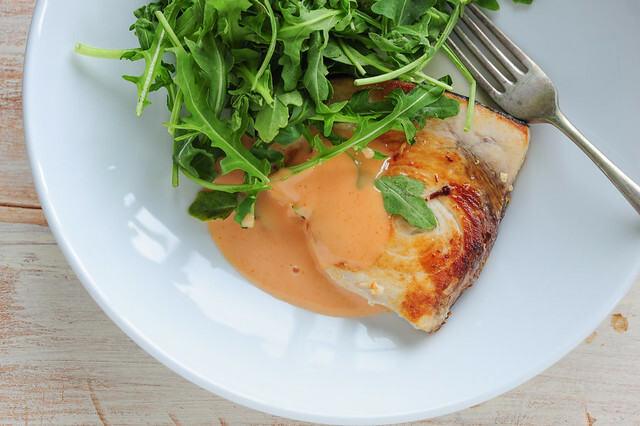 Serve fish with sauce spooned over and leaves on the side. sugar-free – replace ketchup (tomato sauce) with tomato paste – add to taste but I’d start with 1-2 teaspoons. And make sure you’re using a sugar-free mayo. vegetarian – serve with pan fried halloumi or a couple of fried eggs. vegan – use vegan mayo and serve with roast potatoes or sweet potato, or try it with pan fried eggplant ‘steaks’. egg-free – use a vegan mayo. carnivore – replace fish with chicken thigh fillet or breast, pork fillet, pork chops, pork sausages or even a thick juicy steak. Also lovely with a simple roast chicken. different fish – most fish fillets or steaks are good here or you could serve with smoked or canned fish such as tuna or sardines. no tabasco? – replace with a splash of sherry vinegar and some dried chilli powder or chilli flakes. Fresh chilli finely chopped will also work. Here’s wishing you and your “new” family a blessed Christmas and everything of the best for the new year. May you go from strength to strength! Would it be ok made with salmon? Hi Jules, thank you for your tips and clear advice. I love how simple yet, how delicious it looks. The sauce is pretty simple to make and so tasty. Must try it this week. I’m all about simple and delicious! My friend brought a ready-mixed mayochup (yes that is the product name!) from the Middle East, I love the idea of adding a bit of a spicy kick :-) Have to try this soon!